First, check out these new pictures of Evangeline! We are leaving in 20 days - February 16th! That's less than 3 weeks away! We will be returning on the 25th. I am nervous about being away from the kids for so long. While my stomach was in knots about that, my daughter was happily chatting about how she was so excited to have Dell watch her and that she couldn't wait to play with Baby Violet. Then she went on to discuss how fun it would be to hang out with Aunt Mi-Mi (my sister) and Ga Ga (my mom) while we were gone. My mom reminded me that this will be a fabulous opportunity to soak in all things Ethiopian and that it would be best if we weren't rushing around while we were there. I think she's right and we absolutely cannot wait to meet E. It is so surreal! I finished E's baby quilt. This was the first time that I was brave in my quilting and went outside of "stitch in the ditch." I hand sewed the binding to the back of the quilt. This was also a first for me. Look at her in that little hat! 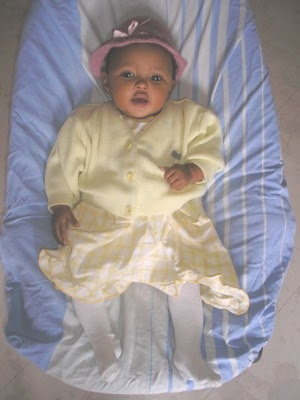 When we picked up Tsehay for her embassy appointment the nannies had dressed her in a frilly dress with a sunbonnet. They wanted her to look her best for her big appointment! The quilt looks great. Wishing you the best as you prepare to meet your daughter soon! I just love her new pictures-like i said on FB...they're almost angelic like! love it! Can't wait for your trip-you'll love it-experience of a lifetime! Your kids will have a blast w/ "dell!" It's fun for them-i'm sure. She is SO beautiful!!!! Perfect indeed!! Lovin the quilt, and as I said before E is stunning. Oh, so exciting!!! E is beautiful, and the quilt fits her well! :) Nicely done! I'll be praying for you- traveling without the kids is very, very hard for you, I'm sure. I'm sure it will be GREAT all around, but hard just the same. 20 days.....I'm giddy with excitement- and to think after that we'll see her beautiful little face ALL THE TIME!!!! I bet you are beside yourself! We are so excited for you! She has changed so much from her early pictures. She looks so healthy and ready to be with her mama! She has no idea the wonderful home she is now a part of...can't wait to meet her! Sending my love and prayers! She is just precious!!! Blessings on your trip!! Three weeks is nothing compared to the wait you have had already!! We are still waiting for that travel call, but hope to travel the second week of February. Just have to wait and see!! Oh just look at that gorgeous little miss!! Thanks for sharing a peek with us AND this time next month she will be HOME with you all! Oh glory be! The kids will have a ball...you will miss them terribly and shop A LOT for them while away :) and then we will all see that incredible first photo of a beautiful family of 5!! The quilt is enchanting....stitched with so much love!! Hugs my friend....I know its overwhelming but it will come together!! She is such a cutie!!! Did you get any updates on her height and weight? We received updated photos of Naomi today, but no updates. What a beautiful baby!! I had run across your blog via the Okrasinski Family blog (hope you don't mind!). 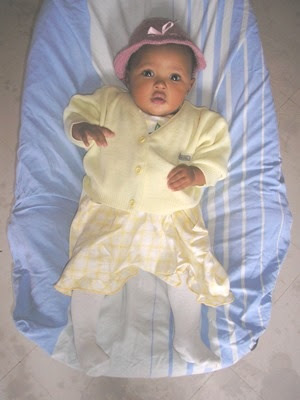 We are embarking on domestic adoption but have seriously considered Ethiopia...until we realized we probably 'age out'. Still think they are some of the most beautiful people on earth! Safe journeys to you - there and back with your baby! The beautiful quilt will be a warm and toasty refuge.